We know how Paul Ryan, in addition to wanting to privatize Social Security also proposes “fixing” Medicare by introducing a “Voucher” system. In the debate, Mitt Romney suggested he still agrees with that Ryan plan for now. When I first heard of this scheme, my first thought was of the Voucher system that has been introduced over the past 20 to 30 years for education. This rant will examine my belief that Vouchers are designed to destroy successful government programs designed to help Americans and at the same time distribute wealth from the middle and working class up to those who don’t need it. In short, the reverse of the Robin Hood tale. Thomas Jefferson and most of our founders believed that if you were going to have government of the People, by the People and for the People, those people had to be knowledgeable and educated. They introduced and promoted basic and advanced education, subsidized by government in order to get as many citizen educated for the least cost to them. Early on they were successful. Though a formal federal program of education was not in place at the time, most of the states instituted education program for their citizens. Many states like Virginia and Massachusetts, abiding by the wishes of Thomas Jefferson and John Adams subsidized advanced education for those who had the ability. Our citizens were so well-informed and educed in our early days, Alexis de Tocqueville commented about it when he toured even the rural areas our country for his book “Democracy in America” how well-informed they were of world events. Education and a vibrant Press kept our citizens able to read, reason and be aware of issues of the day. Over time, though many States still recognized the need for government subsidized education to provide for all citizens, including those of lesser means, assistance was needed from the federal government, not only for financial support, but to establish national standards. In time, the Department of Education was created to monitor and assist this endeavor. Even in 1912 when Arizona became a State, it was written in the State Constitution that a college education was to be made as “free as possible” for citizens of the State. The argument for allowing tax payer funded vouchers to allow students “of all incomes” to attend Catholic or other private schools, (and later Charter Schools) was the argument that public schools were failing to properly educate our children and the parochial and private schools did much better. Over time, the Courts relented and laws were enacted to establish vouchers for private schools. But there were some problems that were not really discussed in the open when this was going on. First of all, although inner city public schools did have the problems you would expect from children from lower socio-economic areas that didn’t generate enough tax revenues to effectively fund those schools; overall, the public schools were doing just fine for the whole. Another problem was “Where would the money come from to pay the tuitions for private, parochial and charter schools?” Well that was simple; money would be diverted from already underfunded public schools making matter worse for them. Finally, “How would voucher help pay tuition for a child from a poor working class family who couldn’t come up with the rest of the money?” In theory, tuition would go down. Well in reality, they didn’t. In fact, they went up. Remember, these schools are in the private sector where profits must be maintained. So what were the results of introducing vouchers to pay for school? More and more tax-payer money has been pulled from public schools to fund voucher for all students to attend private and charter schools. However, since the vouchers do not cover the full tuition costs to attend those schools, working class families can’t afford the tuition with the “education coupon” they get so have only the option of the now even more underfunded public schools. So tax payer dollars end up only benefitting those who don’t even need the money to send their children to private schools. And as the costs of college education continues to sky-rocket and government cutting funding for grants and scholarships, again, only the rich end up being able to afford college educations for their children. Unless you want to get your degree and also be nearly $100,000.00 in debt after you graduate. So school vouchers take from poor, working-class, middle-class and wealthy in taxes and effectively only provide to the wealthiest among us. It is redistribution of wealth upwards. And what is the Free Market Argument AGAINST Vouchers? 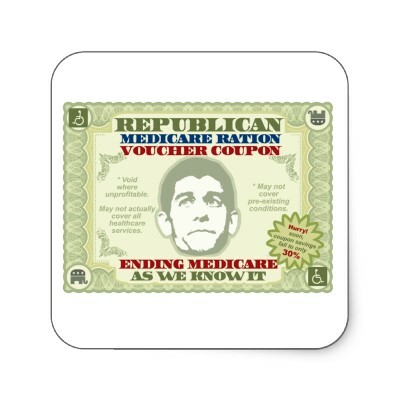 Now for Paul Ryan’s plan to voucherize Medicare (otherwise known as VoucherCare). First of all, it has been no secret since the mid 1960’s that the Republicans want to eliminate Medicare. It is still in their mind “socialize medicine” and should have never been enacted. After all, providing needed medical service to the elderly with only a 3% administrative cost overhead puts private insurance companies to shame. Republicans want to privatize Social Security and Voucherize Medicare. Problem for them is that the people like Social Security and Medicare as it is. What was the famous sign from the Tea Party during the debate for the Affordable Care Act “Keep Government Away from my Medicare”? So to deal with that dilemma they followed their game plan from defunding education services to fund the profits of private schools and universities, “Voucher.” Rather that have government provide healthcare benefits to the elderly, the elderly would get a voucher that they can give to a “for profit” insurance company. Nice plan if it would cover the costs. It won’t. As with educational vouchers, the money for Medicare Vouchers would come from money collected from Payroll taxes, depleting money destined for Medicare to give to the private insurance companies. So money going to an organization with only 3% cost overhead would go to a company with 20% cost overheads who have to show a profit. And keep in mind, prior to ObamaCare, insurance companies could have cost overruns far exceeding 20%. It’s by law that it is limited to 20% now. But that’s why the GOP wants to repeal ObamaCare; it eats into their donor’s profits. Those with the money will now get tax payer money they don’t need to pay for healthcare from private insurance companies. Those who don’t have the money will get a voucher that won’t pay the premiums required for what Medicare already provides. Now they say that the increase of government money going to private insurance companies will drive down the cost. Remember, they said the same thing about private schools and vouchers. It has yet to happen. Just like more jobs being created from trickle-down economics has yet to happen. Tax Payer money going to any “for-profit” organization, whether it be education, healthcare, defense, fire-fighting, policing, what have you only results in more profits to their stockholders with reduced services to the customers who end up not even being able to afford the services provided. Vouchers are a con from the cons who call themselves conservatives whose only interest is to redistribute money upwards to them and their campaign donors. In education it has already resulted in failing schools across the nation, even the private schools. Apply it to Medicare; it would bankrupt the program while insurance companies laugh all the way to the bank. And privatizing Social Security? Well, I think you all get the idea. Education must be part of the commons for it to be any good for the entire nation as should healthcare. Privatization only provides for those at the top at the cost for those at the bottom. This isn’t what the founders wanted for a country Of the People, For the People and By the People. Corporations are not People Mitt.